I have been playing with Raspberry Pis and electronics a lot and my 4 year old son has occasionally come to my desk to play with the red, yellow and green LEDs by sticking them on breadboards. He called them "traffic lights", so I thought to myself, why not build something for him which does that for Christmas! Reading temperature and humidity with Raspberry Pi using DHT22 sensor. Details here. Using a cheap 20x4 LCD display with i2C interface. Details here. Building a simple mobile app using Xamarin which send commands to the Pi HTTP server. I am going to use Xamarin Forms, which is a very handy cross platform (iOS/Android/Windows mobile) framework. Here's the end result wrapped nicely with lego and the app. Since the 20x04 LCD needs 5V and Raspberry Pi accept 3.3V as digital input, a 3.3V / 5V logic converter is needed. A large version is here. 2 processes have been developed to run in the Raspberry pi. Let's assume the code will be run from /home/pi/weather. Lets start with weather.py, there are a few prerequisites to be installed. The code assume you are running Raspbian Wheezy or above on your Raspberry Pi. Older version might require a manual installation of python gpio library. Adafruit_DHT - library for reading temperature and humidity. Run below in Raspberry Pi to install the library. Full details can be found here. Install sqlite3 - sqlite is a very light weight, file based SQL database. Create the database file and table. 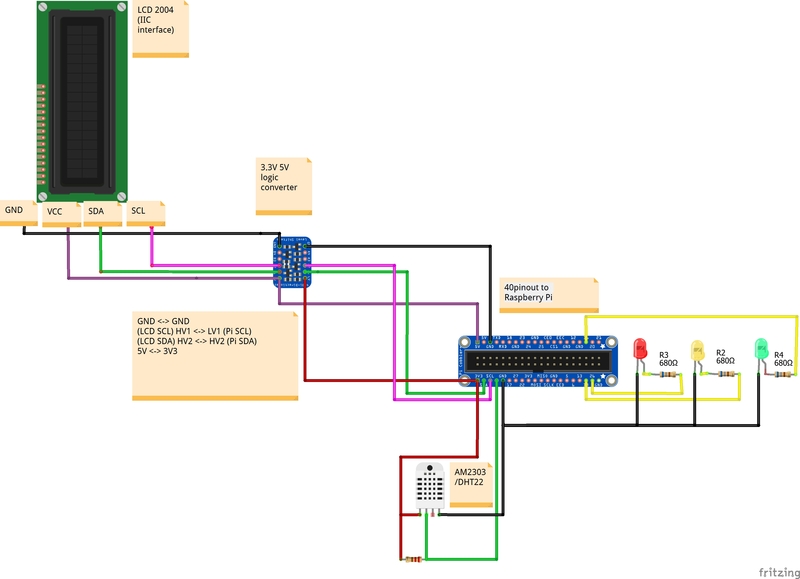 Connect up the i2C 2004 display by following the schematic diagram. Find the address of it by running the following command. For my case, I got 0x27. At this stage, all prerequisites for running weather.py should now be ready. Try to run below (sudo is required for gpio access). If all goes well, you should see something similar to below in the 2004 LCD, showing the datetime, temperature, humidity and ip address (3rd row will show the eth0 and 4th row will show wlan0). weatherwww.py is a flask web application. Flask is a python framework which allows you to write webservices / dynamic webpages written in python easily and quickly. A quickstart guide is available. To install flask, the quickest way to run command as below. You can also run it under virtualenv. Using a browser, test if the flask webapp is working (replace 192.168.11.115 with IP address of your Pi). If it returns "OK", it means the webapp is up and running. The red LED should also be turned on if the electronics are all connected up. It will then enter an infinite loop, which continuously fetches the weather (every 10mins) and refreshes the time on display (around every 30 seconds depending on how long it takes to fetch the weather). There are also some slightly long running methods like this one. Since we are using the built in single threaded flask web container, it will accept any new request when the previous one is still running. To improve this, we can consider changing this to run async starting a new thread and returning response immediately. However, this gets a little trickly as newer requests will need to cancel previously running request. In part 2, I will be talking about the Xamarin mobile app for remote controlling this device. Someone's therapist knows all about you! Nice article on bridging Raspberry Pi, some electonics and controlling it all via a Xamarin app. Well done! extremely nice article sir and where do you get those building bricks which you have used to cover the raspberry pi board? Glad you like the article. They are LEGO blocks.